Dealing with the loss of a loved one is never easy. I know from my own experience that the mourning process takes some time. You just don’t feel like dealing with anything related to their loved ones possessions until you are ready. This can take some time. For me personally, it was probably 12 months before I wanted to spend the time that was needed to go through their things and decide what to do with them. When you are ready, we can help. Below, are 5 different ways that we can help you with a house that you inherited. If you have an inherited house with a lot of things in it, it can be a daunting task to go through everything and most of the time, you feel an obligation to do so. Trust me, I understand. We recommend that families and loved ones spend a few weeks to have everyone go through the items and only take the things they want and then to either use one of many services to have an estate sale, or they can simply sell the house with the remaining items. We have helped countless executors and administrators of estates going through probate, to simply buy the house “as is” with all of the remaining contents that the family doesn’t want, as part of the purchase. This not only saves the family time but is normally a huge burden lifted from everyone involved. In many cases, the probate house you have inherited, has a lot of deferred maintenance or hasn’t been updated in many years. If you were going to sell the house with a real estate agent, you would need to spend the time and money to repair the house and to make it pretty for a buyer to be interested in buying it. We can help by buying the property “as is” with all of it’s problems, issues, and deferred maintenance. This not only greatly speeds up the time for you to be able to sell the house, but also saves you the money that you would need to renovate the house. 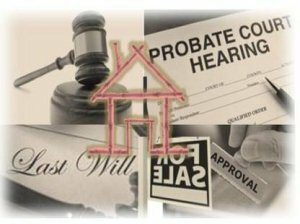 Many of the people we buy probate houses from, are out of state and are not able to be in the area to handle the day to day needs of selling the inherited house. If you sell with a real estate agent, this can be a huge factor. Most real estate agents are not able to completely manage all of the contractors and services that are needed to get the house ready for sale. That can slow the whole process down and cause additional stress on the seller as they do the coordination and payment of the contractors. Since we buy the inherited house “as is” we can help by avoiding all of these issues to start with. Not only that, but we can close on the property remotely so that you never have to fly or drive to meet us for the closing. We make the whole process, super simple and stress free. Not that agents are bad people. In fact, they are some of my favorite people! I have many in my network that I rely on every day. Still, the simple fact remains when you sell a house without a real estate agent, you save money and time. You save time because there is one less person that has to get involved in the selling process. Anytime you reduce the number of steps or people in this case, you are going to save time. You are also going to save money because you don’t have to pay an additional 6% to anyone! You don’t have an agent so you don’t have to pay 3% to them and I don’t have an agent that you have to pay an additional 3%. We can buy your inherited house today. We can help you with your inherited house, no matter the circumstances. We have dealt with many sellers just like you that have had similar situations. Not only that, but we can close in less than 7 days and pay all cash. We can help you sell your inherited house. Give us a call today!